Wondering what flowers to plant to give your garden a great springtime show? Consider the following five blooms. Depending on where you live, it may be too late to plant these flowers for a display this season, but keep these gorgeous blossoms in mind so that next spring you’ll be graced with their beauty in abundance. Pansies love cool weather, so plant them when temperatures are moderate and their roots will then be able to firmly take hold. This annual is a favorite for backyard gardens because it can be planted in early spring and it will bloom quickly afterward. 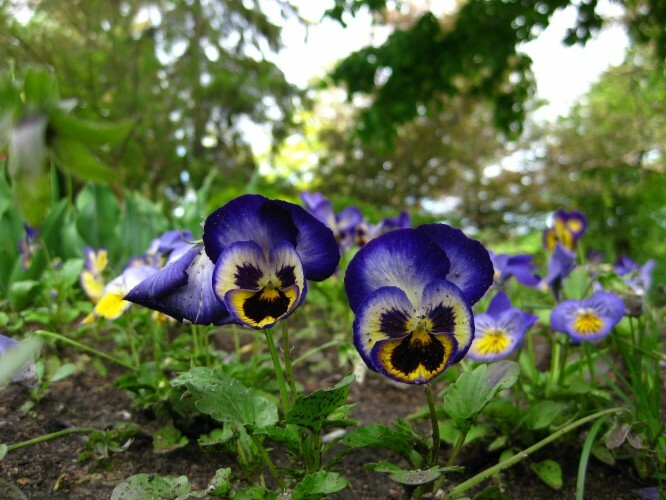 Pansies are cheerful flowers that grow about 10 to 12 inches tall. A true spring-blooming flower, yellow trillium springs to life and then its flowers die back at season’s end. Even the foliage recedes. But, the short show is worth any effort you may expend planting the flowers. Yellow Trillium offers a sunny, cheerful, and yellow-white display throughout most all of April. Hellebore is also called Christmas rose, but it doesn’t come around at Christmas time. You can enjoy this flower in your yard in early spring, but you must plant it at the season’s beginning for a long show. Hellebore can easily withstand cool temperatures, and even a bit of frost, so late-winter planting is just fine. If you want spring flowers in your garden that make early appearances in March, consider bloodroot. This bloom is perfect for shaded or woodland gardens, and it offers tiny bursts of white flowers that last until the end of springtime. Snowdrop anemone are some of our favorite spring flowers for an outdoor garden. These stunning blossoms are meticulously shaped, making them perfect for cutting gardens used to propagate bouquets or indoor flower arrangements. They bloom once in fall and then usually again during springtime. Take your chances with snowdrop anemone. The sight of these flowers is a true delight. These spring flowers will surely turn your garden into a space bursting with the newness and vibrant color of the season. Wondering what flowers to plant to give your garden a great springtime show? Consider the following five blooms.Depending on where you live, it may be too late to plant these flowers for a display this season, but keep these gorgeous blossoms in mind so that next spring you’ll be graced with their beauty in abundance.